While we are aware that some of the live chat tools available in the market today don’t have this feature, which may be the reason some of our customers are not expecting to see this functionality, we try to encourage our clients to utilize the chat tool to its full potential and make sure that they take advantage of the benefits that real-time monitoring offers. How to enable real-time visitor monitoring in your chat console? So which code is the right one? If you log into your account Control Panel at www.providesupport.com and follow to My Account -> Chat Button Codes page, you will see a range of chat codes available on that page. All the script codes support the monitoring feature. For fast start, we suggest using the Fully Featured Chat Button Code, which is marked as Recommended. The code serves its name and if you add it to your website, you need nothing else. All the features available within the software are supported by this code. For your information however, you may note down that Text Chat Link Code, Graphics Chat Button Code with Different Images on Different Site Pages, Hidden Code for Visitor Monitoring and Passing Information Code also support the tracking feature. In some cases you may need to use one of these codes. If you would like to track all pages of your website, a script chat code has to be added to all of your website pages. Alternatively, you can add the code to your header, footer or any other part of your website, which is common to all pages. If you would like to show the chat button only on one or a few pages, but would like to track the whole website, you need to use the combination of the Recommended Fully Featured Chat Button Code (to be added to those pages where you would like to show the chat button) and Hidden Code for Visitor Monitoring (to be added to the rest of the pages which you would like to monitor). What details about the customer does real-time visitor monitoring provide? With real-time monitoring enabled, the following details will be available to the chat support agent in his/her operator console: visitor’s Location, IP address, Browser, Operating System, Current Page, Referrer, Duration of Stay on your website, the number of Hits, Navigation History, user’s Local Time, ISP and Host. Real-time monitoring feature also allows you to view geographic distribution of your website visitors on a world map (screenshot is below). Red dots on the map represent current visitors. If the red dot (visitor) is circled in green, it means your customer is navigating to another page. Users with whom you have chats are put into brackets of different colors depending on their status: a green bracket means you are chatting with the user in the current room; a red one – you have a chat with this user opened in another room; a gray bracket signals that this user has a chat with one of the other online operators. New visitors to your site are marked with a blue sign “New”. Real-time visitor monitoring additionally allows you to pass any details from your website to the operator console. This can be achieved using our Passing Info Code, available on the Chat Button Codes page in your account Control Panel. Detailed instructions on how to use this code you can find in our blog post “How to Pass Additional Visitor Details From Your Website To the Operator Console”. The information passed in this way will be displayed in the Custom Fields column of the Visitors tab. 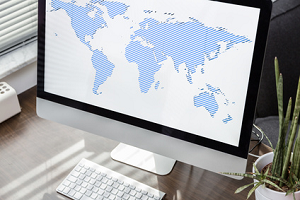 What benefits does real-time monitoring give to a company? Understanding where the customer is calling from, what pages he/she viewed, seeing their membership details or any other additional information provided by the visitor before the chat session, helps the support agent in a way to prepare for the chat and provide more qualified assistance. They can pull up the necessary files or look up their help notes, come up with a more personalized greeting and approach each question and problem individually based on the information they know about the client. Greater efficiency, having access to customer’s information enables the chat agents for faster support. When there is a clear understanding of the customer’s question, the agent can give a precise answer and a solution to the customer’s problem takes less time. Shorter support interactions in their turn convert into reduced cost of customer service. Notifications about new visitors entering the website, empowered by real-time monitoring, allow the chat agents to send proactive invitations to those customers right on the spot. Additionally, when the agent sees what page the customer is viewing, what other pages he/she has browsed, the customer’s membership details or history of interactions with your site, this enables them to send a more personalized invitation and increase the possibility of positive response from the customer. 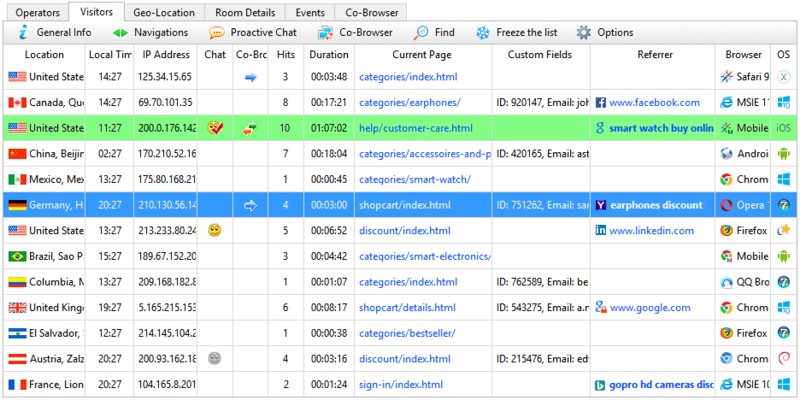 Does your live chat tool has real-time visitor monitoring and are you using it? We hope our article provided you some insights on the benefits and uses of this feature and you will be inspired to utilize it in your chat support and improve the quality of your customer service. We welcome any comments you may have on how you have been using this tool and what other features or improvements you may want to see in it. This post was originally published on May 4, 2015 and last updated on February 5, 2018. This entry was posted in Articles, Best Practice, Instructions, Tips and Tricks and tagged real-time visitor tracking, real-time visitor tracking and live chat, visitor monitoring in chat support. Bookmark the permalink. Great post! I have never thought that this feature now available. This means I can filter customers who wish to chat with a different representative. That is a great feature! Real-time monitoring helps the operatives track a customers movements, where they have been and definitely allows them to provide a more tailored, bespoke customer service experience. We are definitely suggesting Provide Support software as our standard live support software going forward. Great strategy of monitoring visitors in real time, I have not put it on my site and I’m thinking of putting it. The problem is that I need to leave a person all the time to do this. Because I do not have the time myself. Thank you for sharing your experience, Liliane. You are right, live chat gives best results when it is manned by someone systematically. Thanks for the guide. This software seems to have many interesting features. Very good for monitoring the visitors in real-time. Thank you for your feedback, Erwin! What an excellent solution, I’ll be sharing on my website and checking for a better way to use it. It is always good to monitor our readers. It is a must have it for the users of the website..